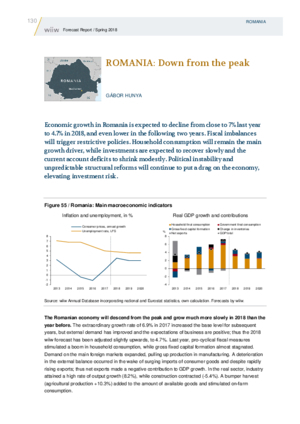 Economic growth in Romania is expected to decline from close to 7% last year to 4.7% in 2018, and even lower in the following two years. Fiscal imbalances will trigger restrictive policies. Household consumption will remain the main growth driver, while investments are expected to recover slowly and the current account deficits to shrink modestly. Political instability and unpredictable structural reforms will continue to put a drag on the economy, elevating investment risk.